Bahramian, A. (2018). The Effect of Tin Weight Fraction and Annealing Condition on Electrical and Optical Properties of ITO/TiO2 Nanostructured Film. 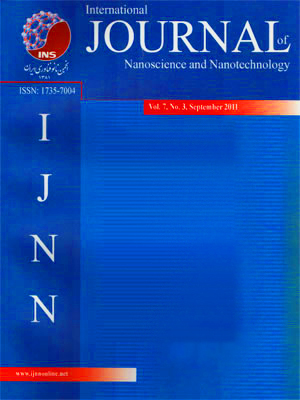 International Journal of Nanoscience and Nanotechnology, 14(4), 307-317. A. Bahramian. "The Effect of Tin Weight Fraction and Annealing Condition on Electrical and Optical Properties of ITO/TiO2 Nanostructured Film". International Journal of Nanoscience and Nanotechnology, 14, 4, 2018, 307-317. Bahramian, A. (2018). 'The Effect of Tin Weight Fraction and Annealing Condition on Electrical and Optical Properties of ITO/TiO2 Nanostructured Film', International Journal of Nanoscience and Nanotechnology, 14(4), pp. 307-317. Bahramian, A. The Effect of Tin Weight Fraction and Annealing Condition on Electrical and Optical Properties of ITO/TiO2 Nanostructured Film. International Journal of Nanoscience and Nanotechnology, 2018; 14(4): 307-317. Department of Chemical Engineering, Hamedan University of Technology, P.O. Box 65155, Hamedan, I. R. Iran. High transparent conductive indium tin oxide/titanium dioxide (ITO/TiO2) nanostructured thin film is prepared by sol-gel dip-coating technique. This method yielded monodisperse ITO nanoparticles with mean diameter of 12 nm. The atomic composition of the Sn within the ITO structure changed from 0-20 wt.%. Through controlled annealing temperature at 550 oC, the results of four-point probe technique showed that the resistivity of the ITO film depends on the Sn doping ratio, the film thickness and atmospheric conditions applied during annealing. The ITO nanostructured film with thickness of 165 nm containing 8 wt.% Sn atoms annealed under vacuum condition showed a low resistivity of 5.1×10-4 Ω-cm and transparency as high as 90% with wavelengths between 500 and 700 nm. The refractive index and extinction coefficient of the ITO/TiO2 thin film is determined by using the UV-vis spectrophotometer. An optical method is used to determine the band gap of the film. Experimental results showed that the refractive index, extinction coefficient, and band gap was closely on the atmospheric conditions and crystallinity of the ITO nanostructures. The monodispersed ITO nanostructures and its preparation methodology can be used for the fabrication of novel thin films that applied for large-scale integrated opto-electronic devices.